From the significant disruption of building the City Rail Link we get two huge benefits. First and foremost, we get a tunnel that transforms our rail network and allow significantly more people to travel around the region free of congestion. But for many of our city streets, it also delivers us blank slate from which we can deliver on the visions that have already been created for the future of the city. It is an opportunity too important to waste. And yet as we highlighted last week, Auckland Transport seem determined to waste that opportunity with their awful plans Albert St and the roads that cross it. At their heart, AT’s plans once again show that many transport engineers and institutions seem to desperately cling to the belief that their role is to find ways of accommodating a set (and growing) level of traffic demand. In doing so they often fail to recognise that drivers respond to road network provided to them. Adding traffic lanes and supersizing intersections is almost always a vain attempt to ‘solve congestion’. But any relief is normally only short lived because traffic tends to act like a gas, expanding to fill any space made available to it. Conversely it has now been seen time and time again that removing capacity from the road network results in traffic melting away as drivers respond to the changes. Some of the most famous examples worldwide have been the removal of an elevated highway and restoration of the stream under it in Cheonggyecheon, Seoul, the removal of the Embarcadero Freeway in San Francisco after it collapsed in the Loma Preita earthquake and recently Paris has permanently closed off a section of road along a bank of the Seine. These have actually resulted in net reductions in vehicle numbers as drivers find alternative routes or change how and when they travel. Albert St south of the intersection has been narrowed down to just one lane southbound with the other five lanes closed off for construction works. Albert St north of the intersection only allows for vehicles to travel northbound. The southbound lanes are closed due to the proximity to the under demolition Downtown site. Customs St has also been narrowed down to just one lane each way through the intersection. Previously there were three lanes westbound and two eastbound. While the works are the scale they are for a reason, in many locations AT also appear to have adopted a policy of trying to minimise disruption for motorists resulting in footpaths that have been cut back and pedestrian phases changed to provide as much capacity for cars as they can. Yet for months now Auckland Transport have pushed the message that people need to change how they travel to avoid carmegeddon including through the use of Jerome Kaino to help push the message. Based on results so far, I think we can say that Auckland Transport’s message has got through and/or that we’re seeing the same result as those examples mentioned earlier. This is because one of the most notable outcomes from the works so far has been a lack of major traffic issues. Peak time congestion doesn’t appear to be any worse than it was before the works started and during the day these roads can still be eerily empty, as this picture from looking South of Wellesley shows. These works and previous city centre improvements show that the drivers will adapt to changes, that the city doesn’t grind to a halt. It confirms we can shape or city to promote more of the things we want and less of the things we don’t. Therefore we believe we need to start looking differently at how we approach roads in the city centre. In some cases, plans that even a few years ago were considered visionary or even just “the best we could hope for” are now starting to look tame. We need to completely rethink how we approach space in the city centre and we can start but looking overseas. Most great cities that we look to have come to realise that right priority for transport in cities is something like below. We need to start thinking the same way too. And not just on those streets most directly affected by the CRL works. Take Customs St as an example. In places it is currently up to seven lanes wide. The City East-West Transport Study (CEWT) suggested the pedestrian space increase a little bit but that there would still be at least three lanes each way. Do we really need four general traffic lanes on Customs St? Do we need traffic on Quay St at all? How soon can we pull down the awful Hobson St flyover? Can we be bolder in how we redesign Hobson and Nelson Streets, including returning them to two way streets? Why do we still even have cars in Queen St? Can we make Fanshawe St less like a motorway sewer? We obviously can’t do everything at once what the CRL works perfectly show is that drivers will adapt, that the sky won’t fall so we might as well be bold and design a world-class city. And of course until we can deliver that bold design, we can always start by trialling it New York style with some planters and temporary solutions. The chief virtue, as everyone agrees, of personal transport vehicles [cars, motorbikes, bikes] is flexibility. Routes and destinations can be quickly changed. Well this virtue works both ways: drivers can very easily change to not use a street or route that they have been in the habit of using just quickly as they can change to a new one. They can also change the time they travel, or, indeed, change to another mode and leave the space-hungers metal box at home or at a Transit Station. This is clearly what is happening here. And this is great news. We do not have to, to use the engineers’ terminology ‘meet traffic demand’ in a place if we do not choose to. We can balance other uses for a street or place against a desired traffic volume, and control that volume with lane supply and quality. Particularly in thriving and growing centres, and especially the big City Centre, where there are so many other means to access the place and incentives to do so are much stronger than: ‘it’s easy to drive to and park at’. So AT and NZTA will simply have to accept that traffic demand models are not Sermons from the Mount. They are not the last word, the final argument, they prove nothing, except that if you provide a four lane road in a thriving city it will fill with traffic. Exactly as a two lane one will. We, the city, the Council, can say that this street or that area, has other values and uses, and whatever the model says; the AT computer does not get to say no. And in this case, access to this area and wider city is about get outrageously supersized through the very project that is causing the road-diet experiment: The CRL. So as these streets and businesses work well enough now, just imagine how much better they’ll work with that hugely upgraded access yet not one more tin box on the street. Flexibility is fantastic. It means we can change things that may have been one way for years. And radically so if we desire. The entire point of spending $3billon on sub-city infrastructure is to improve the city, not simply to keep it exactly as it set last year, or in 1980, 1960, or whenever. To improve is to change; sometimes it seems our transport agencies think their job is to maintain everything exactly as it has been. Yet their client is the future not the past. And transportation is a servant of land-use, not the other way around. Come on AT, you are charged with being change agents for this hitherto dreary part of town; get with the programme. Great article Matt and a good follow up to your “Dear Phil” letter. Question, how come when people get elected to Councils or Parliament individual brilliance is replaced with collective idiocracy? Agree, streets should be about the movement of people not vehicles, in the CBD pedestrians can be some of the biggest movements yet no Super Walkway 1 exists for them, this is why we need Quay (West of Port)/Victoria St to be pedestrian focused for E/W Routes, and Queen St backed with the Laneways such as High St/Lorne/Fort etc. for N/S Movement. This was all part of the City Centre Masterplan 2012. Unfortunately, traffic engineers have been fighting this principle/Plan, this with fear of bad feedback has resulted in 1. Queen is still two lanes (Yes Bus Lanes, but left turns allowed means basically not due to amount of cross streets.) 2. The laneways have been weakened, with lost battles at High St etc. 3. The engineers are trying to keep Victoria at 4 lanes, and they are casting doubt over removal of the Hobson Flyover and the redevelopment of that area as a result. This needs to change. Someone with courage, needs to just come out and say that accommodating cars in the city centre is a low priority. It’s lying there in all sorts of Council and AT reports but it’s not in lights for the public to understand because I guess AT is afraid of the resulting public reaction. So much time and money is wasted dancing around the issue and its a death by a thousand cuts. If it was well discussed in public, people would understand that it’s a simple spatial issue, more space needs to allocated to other modes where the weight of numbers are. They need to front foot this. My impression is that towards the end of the last Labour government, people were being confronted with the need to drop expectations of ever-increasing traffic-growth and road capacity. And most people seemed willing to accept this. But in 2008 along came the National government and Steven Joyce. He preached a totally opposite message and instigated the RoNS programme. Now, more roads for more traffic has returned as the public’s expectation. This has set us back decades, even if we are able to get rid of them next election. I think things that can easily be done are. 1. Reduce Queen St between Mayoral & Britomart to 1 bus lane each way (Future Proofed for LRT), allowing deliveries/trades at certain times of the day. Put a cycleway in & increase the footpaths to cover those old lanes. 2. Complete the Laneway Circuit asap. 3. Reduce Quay St traffic lanes West of the Port. 4. Double Bus Lanes on Wells with increased pedestrian space. 5. Removal of Hobson Flyover and the re-development of that area. Fanshawe Street is tough due to the Busway and the Northern Motorway tbh will be transformed later if NS Rail rather than as result of CRL, though small improvements could be done and would still be great. Great questions. We also need to start pondering the exodus and prohibition of the private motor vehicle in the CBD and other intensified areas in suburbia. Small steps but big dreams! All we need is a toll on each road and off ramp where it enters the CBD. It is the one part of Auckland where public transport alternatives already exist. A tolled cordon would work well. It’s really much simpler than that, as Matt shows above. Just don’t make space for private cars and drivers do the rational thing and choose a better option. It is all within AT’s control, if only they’d admit that this is their task. Perhaps they need to be reminded more firmly of this from above. It seems like a good time to do so…. It depends on what outcome you want. If you use price to manage demand then those with the lowest cost of changing mode will change mode. If you use congestion as a disincentive then those who value their time the least will still drive in the peak. 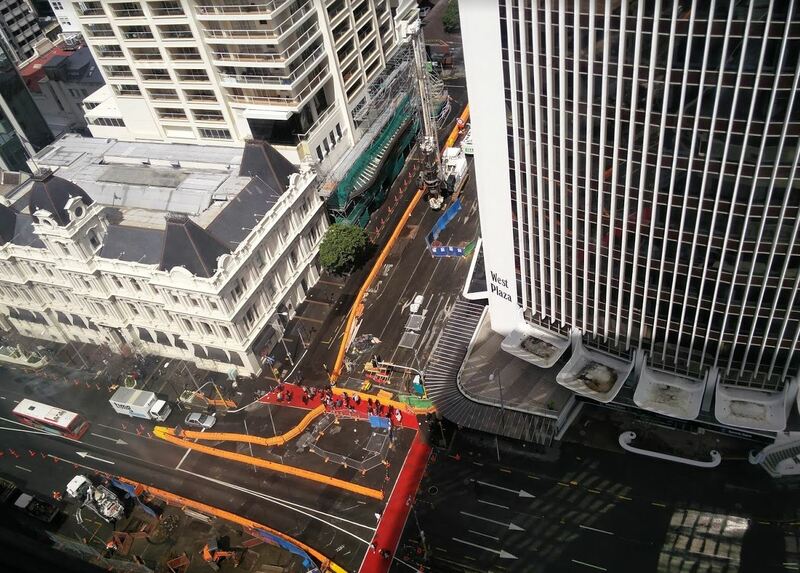 The CBD cordon is the perfect place to roll out road pricing. More people will win than lose. I’m just being practical; it’s a tool we already have, needs no legislation, nor noises political argument. Additionally it already works, it’s been happening all century. Everytime Queen St or other city streets have been improved for other users, drivers, like me, have got the hint, and switched modes. It’s simple, and it’s long overdue that AT owned it. And it’s well within the power of the new Mayor and Council to show citizens that they can direct CCOs to get real. Could be an early win for Goff if he goes in to bat on this. Queen Street needs to be closed to private car users. Make it into a pedestrian priority zone and LRT Zone (with goods loading and unloading only). With East-West Linear Park connecting Victoria and Albert Park, Queen Street Pedestrian Zone/Park will link Elizabeth II and Aotea Square. Why can’t AT and Auckland Council not see that this idea makes Auckland livable and better aesthetically too. Pedestrian in the city outnumbers car users by ten-folds. Queen Street footpaths are already clogged, give us MORE SPACE! Indeed, I’ve thought the same for the last decade or so that I’ve owned an apartment in the city. And I’ve said pretty much the same thing on every consultation. Yet again this blog shows it’s only interested in catering for the privileged who have access to public transport and options. Of course these people are the ones who can afford high cost housing near transport corridors. For the working class and poor who are reliant on vehicles it’s a case of “go and get stuffed” as our socialist masters decide who comes in and out of the CBD. Transport planners should be about providing options, not dictating what transport alternatives users utilise. It is also a lie that road traffic just disappears when you take away lanes. Hasn’t happened in Melbourne has it Matt L where vehicle traffic times have spiralled out of control. Traffic hasn’t disappeared there and it won’t disappear in Auckland. Though I see the transport loonies already have an answer to that as well declaring that vehicle travel time is a poor way to measure the effectiveness of a transport system!! You couldn’t make this stuff up! We should be creating a CBD that caters to all modes of transport. It’s do-able but some within the transport fraternity will have to put aside their irrational hatred of cars. I agree, lets cater to public transport, walking and cycling here. Perhaps we could use some of the 80% of space currently given to cars. This argument makes no sense. By far the cheapest way to access the city centre is by Active or Transit modes. Just take parking costs alone, and it is safe to assume that most poor people do not have free executive carparks, driving is by far the most expensive mode to access the City Centre with. Your argument makes no sense, if you are really concerned about the financially stressed you would be entirely backing improvements in Transit and cycling for these people, and not fretting so emotionally about the convenience for the executive with a subsidised carpark and a desire to drive everywhere in peak traffic. And actually no, the City Centre is precisely one area where the private car user brings so many more disbenefits than benefits, lumps cost and delay onto more valuable road users, especially commercial, Transit, and Active ones. Also I strongly urge you to try to stay rational in your analysis, claiming ‘hatred’ or similar as the motivation for our views on City Centre street priority is silly and just a way to avoid the debate. A little melodramatic perhaps but the point still stands. We can add additional lines of transport without minimising what we already have. Consumers will choose which mode best suits them. For the person who loves the lifestyle in Laingholm perhaps driving their electric car to and from work every day makes sense. For the person living 500m walk from the Mt Eden train station perhaps that method makes sense. Transport options compliment one another and that includes cars. As we have shown with the addition of the CRL, the Northern Busway and some cycle lanes, vehicle routes need not be affected by adding new transport options. Well no we can’t; space is finite. To have bus lanes, traffic, parking, or pedestrian lanes have to go, same for cycle lanes. Currently the least spatially efficient mode takes the greatest about of space. This is cleary irrational, inefficient, and needs to change. This is simply about efficiency and equity. About increasing access and amenity within the existing limited resource. And as Matt clearly shows above, this is in fact a painless move, traffic does adjust. There is no carmageddon. It’s just a rational change. An improvement. Admittedly one that AT’s engineers and executive have trouble owning, it is a cultural shift for them, but we have to assume that reason will overcome their decision making eventually, not emotion, habit, or ‘what we’ve always done’. Um. I think that’s what he’s saying. Not sure if it’s true, but I think that’s what he means. Matthew, hated of cars is not irrational. Seems very rational to me. They have their place. But they should not overly dictate every other means of traffic. So the dislike (avoiding the word hate – it’s so Trumpian) of cars is entirely founded on a same, rational basis, that the preponderance of use of one, highly individualistic and also highly selfish mode of transport, should not necessarily take precedence over all other means of traffic. ‘Transport planners should be about providing options’ – yes, but in the centres of big cities there’s competition for limited space, so it makes sense to prioritise the more space-efficient modes. I don’t think anyone is suggesting that cars should be banned from the city – just not encouraged, and public transport options improved so that fewer people need to drive. There should still be adequate mobility for the few with special reasons to have a car in the city – late shifts, disabled etc. – but their needs are more outside peak hours and so should not be in conflict with road diets. Remember that all change is at the margin: with policies to reduce car use in the city, those who can more easily change their habits will, and those who can’t won’t. That’s to be expected and is not a problem. Traffic volumes in the city centre are indeed congested at peak commuter times, but are a fraction of the volume at off peak times. In some cases (e.g. fanshawe st) the hourly volume through the middle of the day is 10% of that during the busy one hour in the morning, i.e. all but empty. This is demonstrable fact, and easily observable for anyone who walks around the CBD at 9:15 in the morning. You could play a game of cricket on Victoria St during the middle of the day and you’d get a tea break in before you had to dodge a car. On the flip side, pedestrian volumes are high at peak and across the middle of the day, far more so than commuter traffic. Anyone who walks up Queen St can see that. a) commute to the city centre, at b) peak times in c) a private motorcar. i.e. it is only 9-5 office commuters who insist on driving at peak to the worst possible place that are affected. We aren’t talking about the working class and poor, we are talking about the complete opposite. Don’t drive to the CBD on weekdays at peak commuter times? Not affected. If you drive anywhere else in the region, or if you drive to the CBD but not at peak times, or if you do travel to the CBD at peak times but don’t drive… then you are a beneficiary of these actions. You have to ask yourself what is so special about these so called elites that they deserve a massive over allocation of public space? For example, why do the drivers on Queen St who make up 10% of users, get half the road width? Especially when none of them are going to Queen St itself (they can’t be, not a single driveway or parking building on the whole street). Why are the 90% of people on foot forced into congestion and to walk in the kerb and dodge courier vans, so that the 10% can use the street as a convenient bypass to somewhere else? Now this is rich, your greatest absurdity. So some transport planner in the 1960s allocates almost all of the public space in the city centre to traffic movements, and in the process removed the trams, squeezed down the foopaths, pulled out pedestrian crossing to install high speed slip lanes… and that doesn’t count as “dictating what transport users utilise”?! You might be right if traffic were the majority, maybe it should keep a majority of the space. But it’s not, pedestrians are the majority in the city centre. To reallocate some space back to pedestrians is simply acknowledging what transport choices people have already made. To say we need to keep huge lane widths everywhere is to dictate what transport people should use against their wishes and their actions! You sir are guilty of the very thing you are complaining against. I agree with the sentiment here, but you have left Albert Street out of your final list of questions. It is true that Albert Street currently has two traffic lanes, but it also has no buses for the time being. 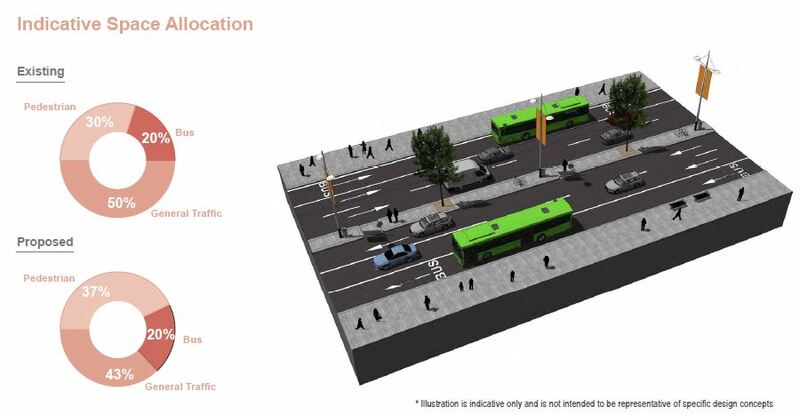 AT argues that once the buses return Albert Street will need to increase to 6 lanes of traffic. Their traffic pyramid for Albert Street is the same as the traffic pyramid for Fanshawe Street. Public Transit on top, followed by cars, and pedestrians on the bottom. All other forms of transit are excluded. I attended the ACCAB meeting where AT presented its plans for Albert Street. When asked why commuters couldn’t be bused to a suburban train station and then travel down Albert Street by train, AT said commuters were not willing to transfer from bus to train. When asked why commuters couldn’t be bused to Mayoral Drive and walk down Albert Street or transfer to a link bus, there was no answer. Do commuters really demand that they get door to door service from buses? The traffic pyramid you depict here with pedestrians on top, public transit fourth in line and private cars in seventh place is great. Everyone is a pedestrian once they arrive in the CBD. Everyone benefits from a walkable city, but all commuters have to be willing to accept some inconvenience when entering and leaving the CBD. One of the more interesting responses to the Albert Street designs at the ACCAB meeting came from the ANZ Tower, where 2,000 people now work. The representative of this building made it clear if the proposed Albert Street designs went forward his tenants would leave Albert Street. Does Pairs have buses? Does London have buses? Does Barcelona have buses? These cities have incredibly rich subway systems, yet they still have buses right in the middle of the city. If you think that because we are getting one underground Metro Line we will never have to see a bus again in the Central City you are mistaken. Our new rail system will only reach out in three directions, leaving at least three other major directions not in the rail catchment: the North Shore, the Northwest, and the Isthmus. And while it is reasonable to expect people to transfer to rail where there is still some way to go and the train is faster, better, and (ahem) more reliable, as can be clearly observed at Panmure from the southeast, at New Lynn from the Waitakeres, at Manukau City from the wider south, and soon at Otahuhu from the southwest, it is not likely that people will bus almost all the way to say K’Rd from the Northwest, and transfer at a tucked away station for a one stop ride. Yes we are building a transfer system, but that only works where it is rational for the user to choose to transfer. Then there are the crosstown local access distributors like the Links…. Of course it will always be better if the sheer numbers of buses can be reduced, and the CRL will do that from otherwise would have been the case, then we have all got to push for the next harbour crossing to be a Rapid Transit rail one, so the huge numbers of buses from the Shore can be reduced. Did people ask why they needed all that space for cars? No one spoke to the issue of cars on Albert Street. The CRL team volunteered that many of the right turn lanes were probably unnecessary and could be eliminated. When the conversation turned to K RD, the woman who represented cultural interests said her constituents went to the Opera and art galleries and they expected and demanded door to door service. So the overall issue was the road width? Could just as easily be fixed by removing car space as bus space. Eg making one way single lane for cars. K road people demand door to door service from who? PT operators? What does that mean? She’s claiming luvvies simply must drive for cultural reasons. Sounds more like a Remuera attitude than a K’Rd one. Well it sounds like an issue for the venues to provide sufficient parking for their patrons then! Not sure what it has to do with the design of K Road as I dont think anyone is proposing zero access for private vehicles. I don’t know where she lives. Some people don’t work in the city centre, but they commute there for cultural activities. I think she was saying these people have high expectations of street access and convenience as well. Current design for K Rd, don’t call for eliminating street parking and loading zones, but the PT people haven’t been consulted yet. The designers working on K Road made a fairly strong indication that 24 hour bus lanes would be necessary. I see. An obvious solution sounds like median bus lanes to allow kerb access for taxis etc. So what is going to be the alternate to Quay St? If you want Fanshawe St to be less like a motorway sewer then that’s out. And Grafton Gully is backed up by 4pm, so packing two additional streets’ worth of traffic through there is out. The triangle diagram is wrong – assuming there is something wrong with planes – there is not, and we would be much better off if all the people who drove long distances needlessly flew and found land transport at the other end to get them to their final destination. Planes are public transport – yes they use lots of fuel, but for short times only. Do we really want all the people who drive from Auckland to Wellington or even shorter distances doing so, when they should be airborne? Key phrase in that diagram: “In cities”. For travel between cities, the diagram would naturally look quite a bit different, probably with planes further up depending upon distances between cities. Also note that a key barrier to flying between cities is how to get around the city *once* you arrive. For instance, if I were visiting Tauranga I’d almost certainly drive, in spite of the fact that it’s a waste of time and a safety hazard to boot, because (a) the time I save driving is offset by the time it takes to travel to Auckland Airport and (b) once I get to Tauranga, I need a car anyway. If Auckland had a faster/more reliable public transport link to the airport, and if Tauranga had better public transport and walking/cycling options, I’d happily make a different choice. I live in Hamilton and frequently go to Mount Maunganui to surf. I cross the rail line 4 times to do so. We are terrible at intercity PT in New Zealand. I wouldn’t worry about the ‘traffic’ (what does that mean?) 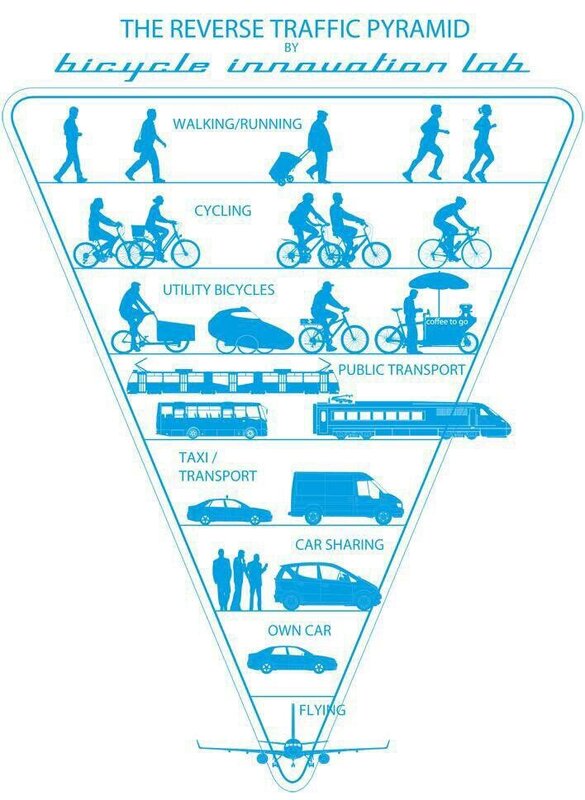 triangle, it’s obviously not about commuting, otherwise PT would be at the top.